A cleaner from Brighton is preparing to sing in front of the Prince of Wales at a concert to raise money for Tibet. Soname Yangchen is a refugee, who has made her home in East Sussex. 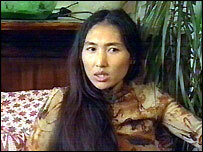 She escaped the Chinese administration occupying her native country of Tibet in 1989, aged 15. Following a six-week journey, she lived in northern India for six years, where she worked and studied before coming to England and developing her singing career. Her songs are her own compositions, written and performed in Tibetan. She describes them as "contemporary Tibetan mountain songs", which reflect the tragedy of her country and her own life. She has made two CDs and is now looking for a producer to work on her third one. During her time in England, Soname, 29, has performed at public performances in Brighton, Lewes and London. When she is not singing of her homeland, she works as a cleaner for £100 a week. She said although she was grateful for her job, she continued to think about Tibet, where there was no freedom of speech and "no use" for the Tibetan language. "My heart is still in Tibet and when it is free I will go back and help in whatever way I can." Soname is hoping Sunday's concert will raise her profile, as well as that of her homeland. However, she is undaunted about performing before royalty. "I don't feel anything special about it. I am glad to be doing something to help Tibet." An Evening for Tibet with Soname, Lesley Garrett and Royal Ballet principal Zenaida Yanowsky is at the Vilar Floral Hall, at London's Royal Opera House.